A couple of days ago, I had this great idea. I don’t actually remember why. The funny thing is, I had some clue as to what it might have been, but then the whole day passed and I realised that I was writing this entry at about 23:00. So yeah. I keep telling myself that this entry is going to be awesome, full of screenshots and stuff, but that keeps holding me back and I keep forgetting to post. No surprise, I stopped in the middle of this again (in order to go to bed) and picked it back up in the morning. That’s kind of the way things have been going. But it is/was a great idea. 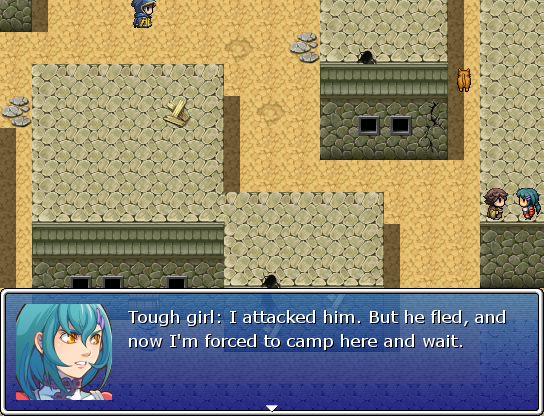 Dither and I are making a game with RPG Maker VX. Its working title is Desiderata, which actually has something to do with the plot. We don’t have a title screen drawn up yet, otherwise I would post one here to start off the screenshots. Since I don’t, this is the perfect time to talk about the music. It’s all royalty free with attribution, and it sounds great. So far I have used about 9-12 tracks in the game, which gives a hint as to its current length. Dither is doing the maps while I’ve made the characters and come up with the story. I also “made” a lot of the graphics with sprite generators and tweaking, and I’ve done most of the music placement myself. I haven’t gotten into scripting yet, and I’m not sure how much I want to, but the regular RPG Maker Event code stuff is pretty much entirely me. I’m not the greatest at it, so most of my time is spent testing. I’m also a perfectionist, so I’m forever going back and adding or tweaking things, which then in turn, must be tested. Anyway, the story so far centres (more or less) around Nod, a thief in the desert city of Clarion. He steals a guy’s purse and gets chided by his sister, then finds that there is also some kind of amulet in the stolen purse. Nod decides to ask his fence in the Westside Slums about the amulet, in case it’s valuable. The way to the slums is currently blocked, so the player has to explore around until it opens. 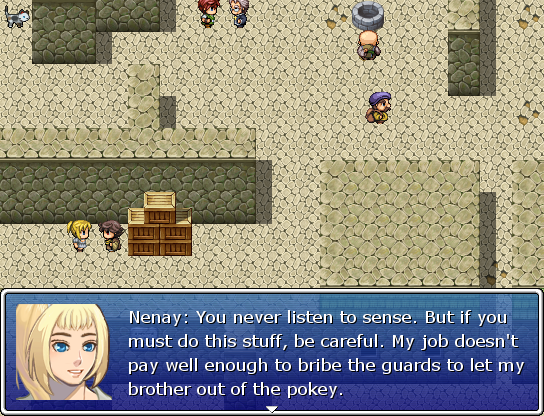 There are some sidequests of varying pay-off, and more talking with Nenay, which adds to the quest to speak with the fence (who fronts as a jeweller). But when you finally get into the slums, there’s a weird girl watching the entrance. Upon questioning her, she tells you that she’s looking for a thief who stole something from her. After wondering if it might be someone you know, you head to the jeweller’s shop. Unfortunately for Nod, he’s closed. And more convoluted things. Maybe sometime I’ll put together a video of the first half hour (probably when there is more than that, haha). It feels kind of wrong to outline everything that happens, and writing it in vague terms like this doesn’t work either. Sounds great… I always imagined my self creating a game with a great story. Good work. Thanks. I highly recommend getting into the indie game-making scene. There are some cool people, and it is a lot of fun to write for games. I’ve gotten some of my best dialogue in this project.